Doctor Who‘s format is ever-shifting, making it very hard to categorise it outside of “Monster of the Week”, and even that does a disservice to the likes of The Gunfighters, A Christmas Carol, and Heaven Sent. But if I were to elect a perfect example of Doctor Who, it would be The Bells of Saint John. Why does it work so well? Because it’s bold, it’s clever, it’s exciting, it’s creepy. It’s everything Doctor Who should be. I spoke to Andy Reynolds, the DWC’s co-founder about this, and we both came to the conclusion that it’s an overlooked gem, and to me, the beginning of an underrated run of episodes, i.e. Series 7b. In that half-series, there are only two serials I’m not so keen on, and yet they still have enough in them for me to enjoy. 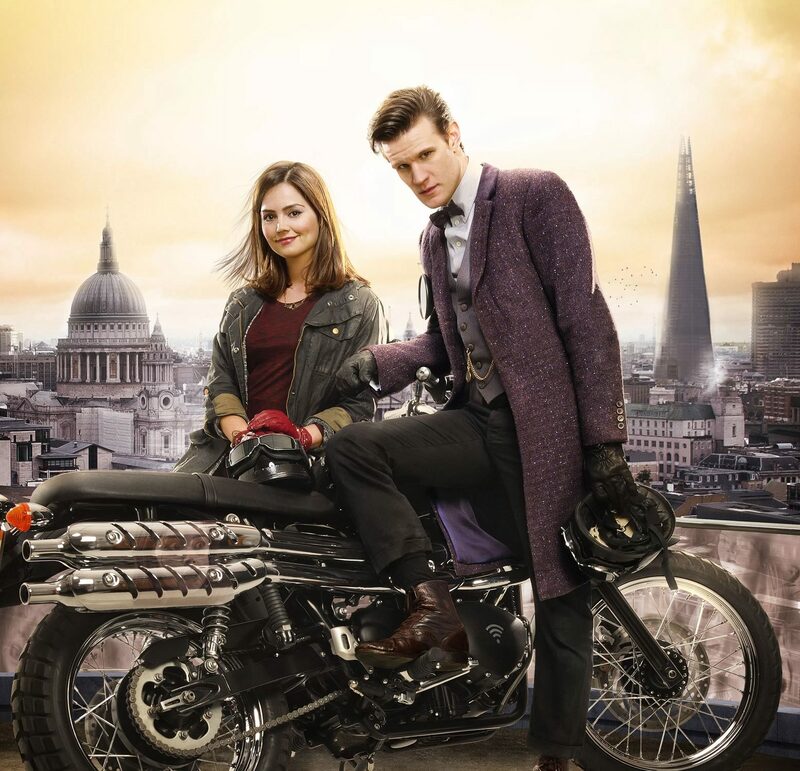 The Bells of Saint John kick-started the show’s 50th anniversary year, pairing the Eleventh Doctor (Matt Smith) with Clara Oswald (Jenna Coleman) as the former tried to unravel the mystery of “the woman twice dead,” the Impossible Girl. 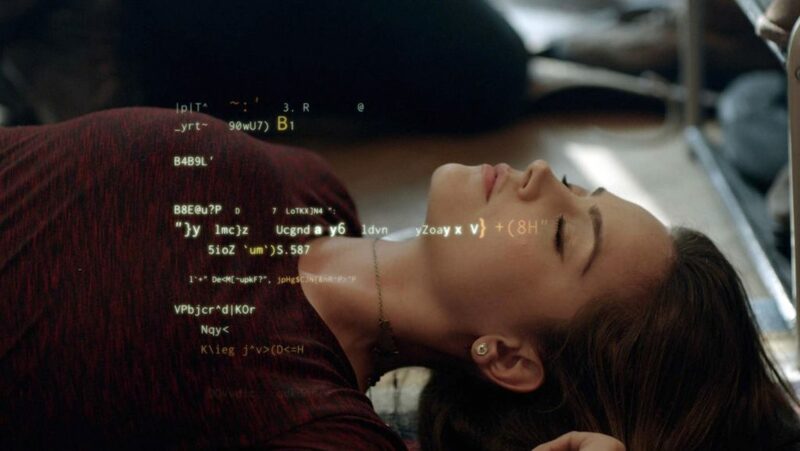 This is perhaps where people come up against a stumbling block: they argue that this Clara wasn’t properly fleshed-out, that she was a plot device and nothing more, but it’s a viewpoint I’ve never been able to relate to. This Clara is a lot more likeable, a lot subtler, and a lot more suitable for the Doctor than her stroppier Series 8 persona. This was a companion team who hit it off beautifully, despite some friction. Matt Smith is, of course, at the height of his powers as the Doctor – but then, when isn’t that true? He’s naturally playful, funny, and thoughtful, but the situation exacerbates his enigmatic, manipulative nature; often attributed to the Seventh Doctor (Sylvester McCoy), this incarnation is cunning as well, and we’d see the lengths he’d go to in The Rings of Akhaten. Though I love Amy (Karen Gillan) and Rory (Arthur Darvill), Clara’s introduction brings a freshness to the show: this is a new dynamic, with a new set of mysteries, new monsters, new situations, and a new backdrop. It’s perhaps ironic, then, that the first monster to feature in this fresh set of tales is, in fact, a very old one, albeit reintroduced in something of an origin story in the previous episode. It’s testament to Steven Moffat’s writing that the Great Intelligence (Richard E. Grant) is used in a different way, so doesn’t undermine the inventiveness of the story, but instead enhances it. The alien’s plan, in essence, is a mix between Downtime, The War Machines, and The Idiot’s Lantern, but the execution makes it feel refreshing. 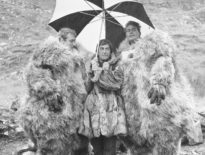 Moffat takes the Intelligence’s old-fashioned foamy “web” and adapts it for the latest generation, and once more plays on fears about the everyday, the ordinary: the “wi-fi soup” we all live in. The Doctor supposing that something has got into it and is harvesting human minds is a very troubling thought indeed, especially as we’re interacting with such an online web right this very second. Pick up your phone, your tablet, your smart home products and question what a disembodied presence could do to mankind. Of course, half the execution is down to Colm McCarthy. I’m always shocked he’s not been asked back to direct more episodes because look at The Bells of Saint John: it’s just gorgeous. He brings a sleek and stylish palette to proceedings, and Moffat’s advice – to treat the show as your own, pushing it however far you want to go, and brushing aside the past – results in something that feels like nothing else on TV. No, not even Sherlock. And this brings us to my favourite sequence in the story, and actually, one of my favourite in Doctor Who‘s history. This, more than anything, encapsulates everything the series does so brilliantly. It begins with Clara waking up, some half-finished Jammie Dodgers by her bed, and a floppy-haired alien vowing to protect her. ” Well then, you should go to sleep. Because you’re safe now; I promise,” he says, and you believe him. Matt’s gentleness in that one scene is wonderfully touching, as is the Doctor’s apparent nervousness when Clara tells him she’s coming down to see him. Next, we get an eerie revelation that Clara’s been “hacked” followed by the gorgeous lighting contrasts as the city behind them goes dark and the road is lit up. Just two episodes ago, the Doctor needed “landing lights”; he’s not the only one. 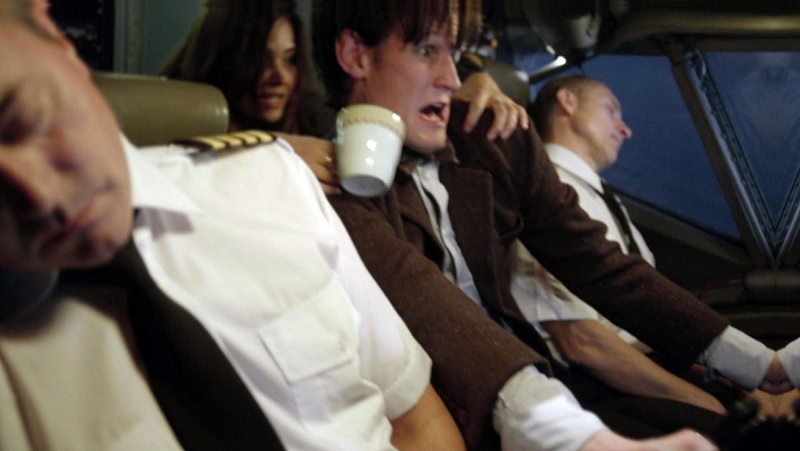 This swiftly segues into an utterly unique sequence in which the Doctor and Clara are attacked by a flippin’ airplane, he demonstrates the TARDIS’ incredible abilities, and they end up flying said mechanical contraption in order to save themselves and everyone on the plane. What do I love about this? I love how exciting it is; I love the visuals; I love the ingenuity of it all; I love Matt’s mastery of the TARDIS; and I love that Clara doesn’t spill her tea once. Look at the ambition of our dear little show. Try to think of another series or film that could do this. It’s just a truly wonderful thing. 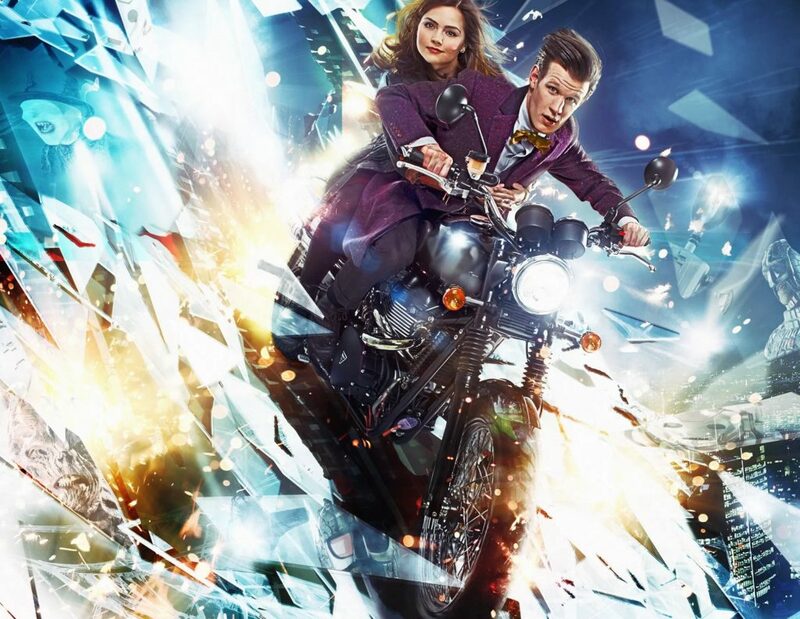 Doctor Who flits between genres – we all know that. Considering the popularity of thrillers, however, it’s strange that Who very rarely ventures into such territory. But based on the might of The Bells of Saint John, it really should do so more often. Features	Whatever Happened to The Web of Fear Episode 3?